After a fitful sleep (yes, my leg was protesting it’s previous day’s workout) we got up and broke camp for the final time. Breakfast was at 8 am and the bus met us at 9 am. Omar ( our Chilean Patagonia mountain guide) wanted to take us on one last walk to see the fauna of the region. When the bus stopped to let us off, the wind was blowing sideways, sleet and hail were traveling with it, and two other groups had headed out on the trail ahead of us…I stepped outside the bus and felt the wind and my gimpy leg and thought…do I really think I’ll see anything that I haven’t already? We’ve seemed dozens of Guanacos, wild hare ( as well as wild hair! ), condors, falcons, Patagonia finches, flickers, hawks, Patagonia geese and ducks etc…the only thing we hadn’t seen was a Puma, but I didn’t expect to see one here! ​Dan had headed off, but I took one look at Janet and asked her if she really wanted to do this…she said no, so back we both went to the bus, soon joined by June and Dan! The rest of the group headed off, and we went with the bus driver down the road to turn the bus around. We actually saw more animals on our drive, than the group saw on their shortened hike!! Once we were all back on the bus we headed for the Chile / Argentinian border. First stop was Chile border control, where they took the entrance passes from all of us! Then a few km across no man’s land ( across the best maintained stretch of highway along the entire journey) to the Argentinian border! At this point, the wind was blowing even harder and it began to snow! ​Once everyone cleared the border, we were off to El Calafante. Traveling across very barren country(…enough grass to graze cattle and sheep), the winds were absolutely treacherous! The bus driver had to be a weight lifter to maintain control of the steering wheel, and then we would pass a double decker bus, and the wake from that would send us flying! Needless to say, not a lot of sleep was had on that bus ride! We finally made it to our hotel in El Calafante. At first, the hotel seemed to be a little “rustic”, however once inside our room, the warmth of the room coupled with the luxurious ness of the shower turned it into the Taj Mahal! 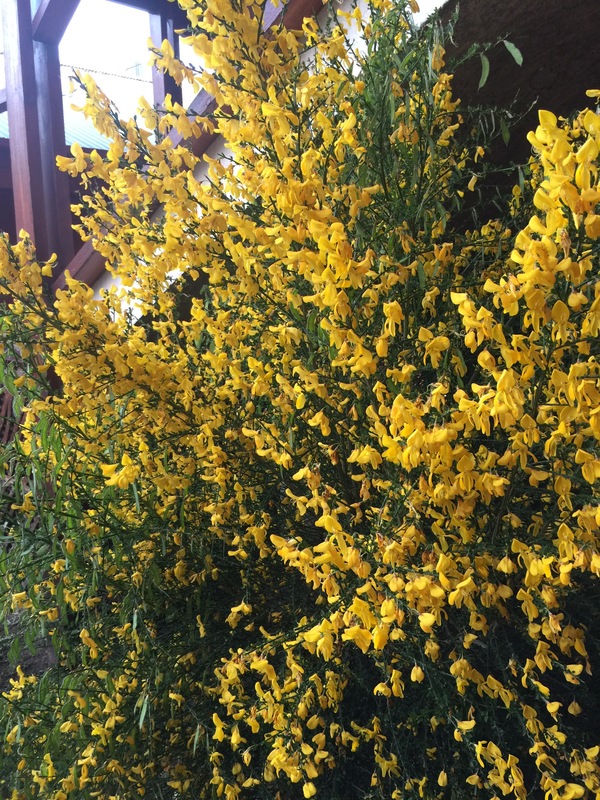 We even had a broom flower bush in full flower just outside our door! 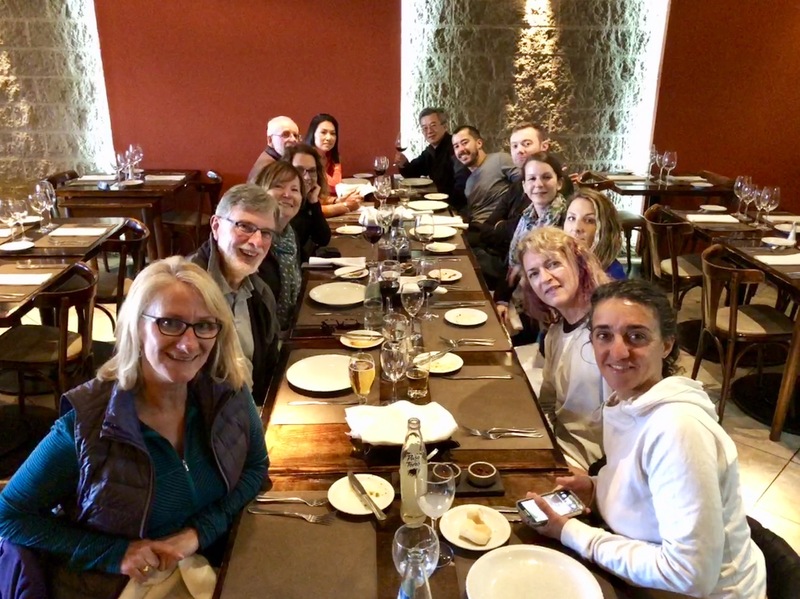 After a couple of hours of clean-up and resettling after our camping escapades we all headed out for a true Argentinian BBQ. This was the land of lamb, and they had the meat roast in the window! 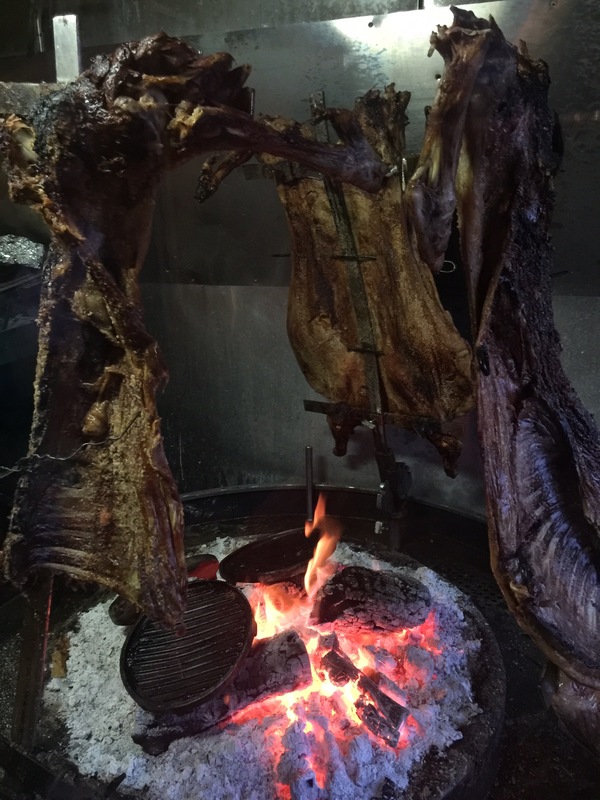 Dan and I couldn’t refuse, so we enjoyed a great meal – Argentinian style! Bellies full and leg in need of healing, we were off to bed with the appropriate NSAIDs! Did you know they sell OTC Ibuprofin in 600mg tablets here??? They must be catering to a lot of aching climbers!!! Only if you were walking in it!!! Looking forward to seeing you all on Saturday! More great memories! Life on the edge! Very! Not in Kansas any more!!! And I thought 400mg was the max! Nothing like a hot shower and a cold cerveza after sleeping in the cold outdoors! They know pain here at a whole new level I guess!